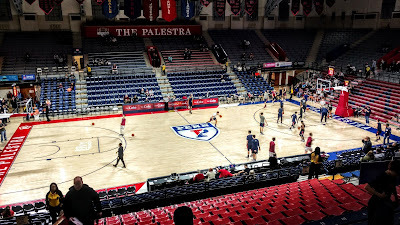 The second half of my perfect Philadelphia doubleheader was at the Palestra, home of the Pennsylvania Quakers. Opened in 1927, it is the third oldest college basketball venue in the country, behind Northeastern's Matthews Arena in Boston and Fordham's Rose Hill Gym, but has hosted the most games in history. 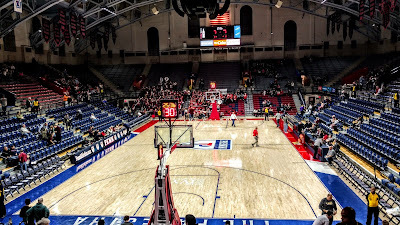 I had long wanted to see a game here, and was very excited as I walked over from Drexel after witnessing a thrilling game there. 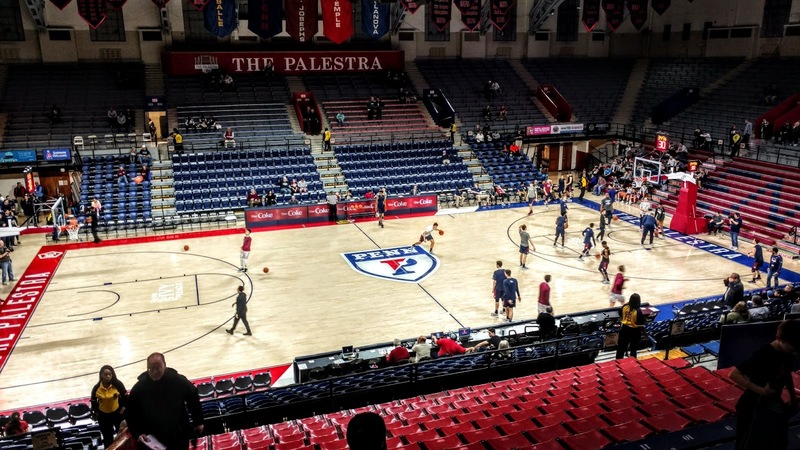 The two schools are right next to each other and the jaunt from Drexel's DAC to Penn's Palestra is less than 10 minutes. Walk south along 33rd Street and go across Shoemaker Green to get to the majestic main entrance, shown above. This incredible building was lit up nicely at dusk. Just inside the center doors is the ticket office, which is a circular booth reminiscent of the information kiosk in Grand Central Station. 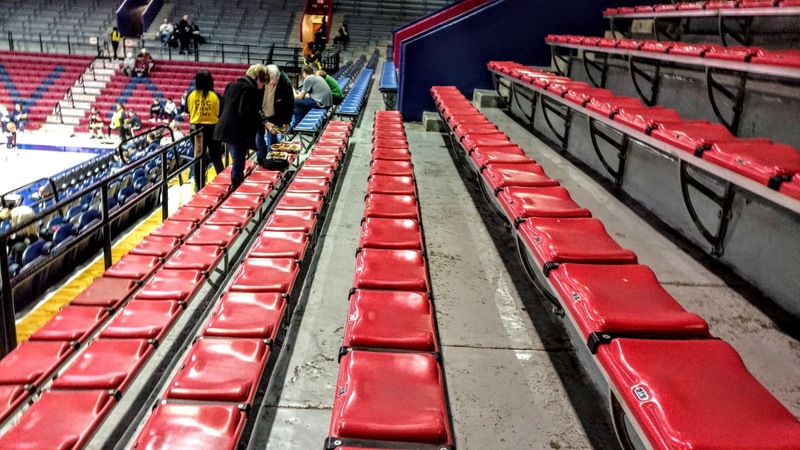 Tickets on game day for Ivy League matches are $25, surprisingly expensive for a mid-major college. The Palestra was given its name by Dr. William N. Bates, a professor of Greek language and literature. In ancient Greece, young men would compete in a variety of events in a rectangular enclosure attached to the gymnasium, which was known as a Palestra. Over 90 years later, the moniker still stands. I can only assume that naming rights are not for sale. The concourse is where you want to spend most of the pregame as it is filled with historical information and displays. 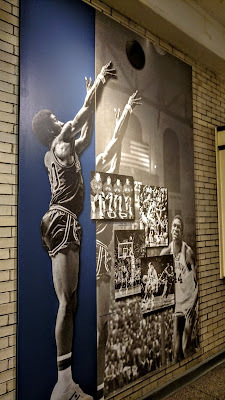 Both Penn's history and that of Philadelphia's Big 5 is shown, along with pieces on local high school athletes who played here, such as Kobe Bryant. 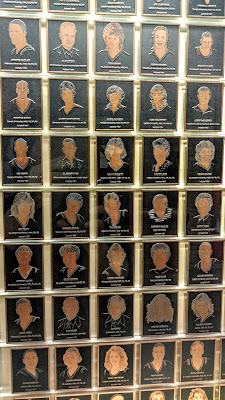 Each era in Penn basketball is given its own display case, and these are worth reading for any sports fan. 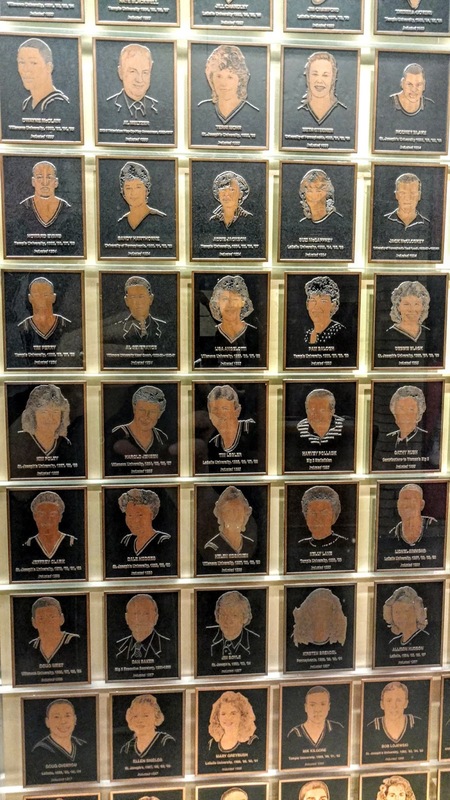 Other happenings and players are highlighted on several more boards all around the hallway. 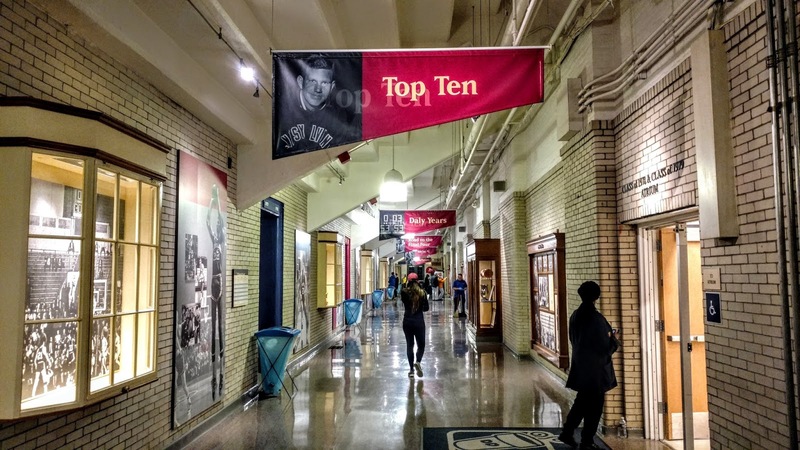 One of my favourites is Images of The Palestra, which shows other uses of the facility over the past 90 years, including when it was a Navy Mess Hall during WWII. 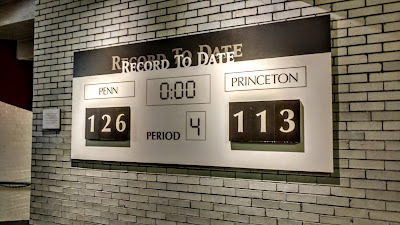 Princeton is Penn's most serious rival and their record to date is shown on another wall. As you can tell, this series has been going on for a long time. 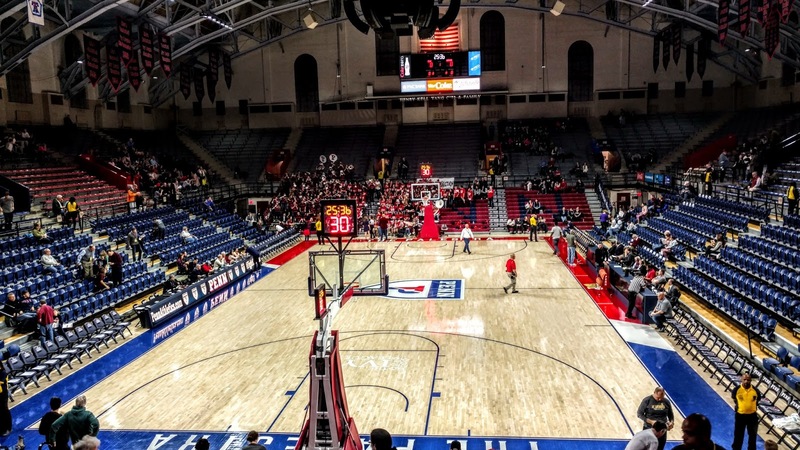 The Big 5 comprises five of the six Division I schools in Philadelphia (Drexel is excluded). Each team plays the other once during the season (La Salle and St. Joseph's are in the same conference, so only one matchup counts in the Big 5) and many of those games used to be played here. The school who wins the most games (usually by going 4-0) is the Big 5 champion. There is quite a bit of Big 5 information on display, including a Hall of Fame for both men's and women's players who starred in those games over the years. 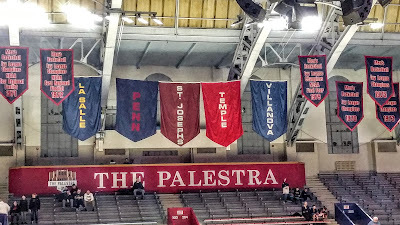 Each Big 5 school has a banner inside the gym, although these days, most non-Penn games are played away from the Palestra. 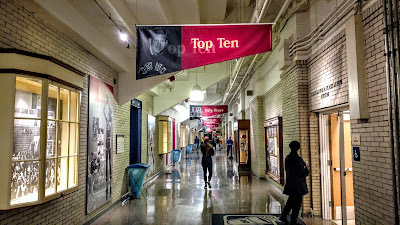 There is also an atrium entrance near the Southwest entrance and it seemed like more memorabilia was on display there, but it was closed after the game and I did not get inside to see it. 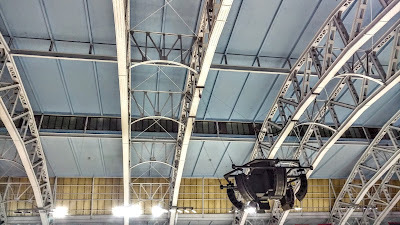 The court is surrounded by two levels of seating on all four sides. I was there early so the arena was empty but by game time, all but the top corners were filled and the place was very noisy indeed. Chairback seats are available down low, while individual plastic seats make up the middle portion on the south sidelines (below), while old wooden bleachers are at the top all around. Comfort is not a concern here. 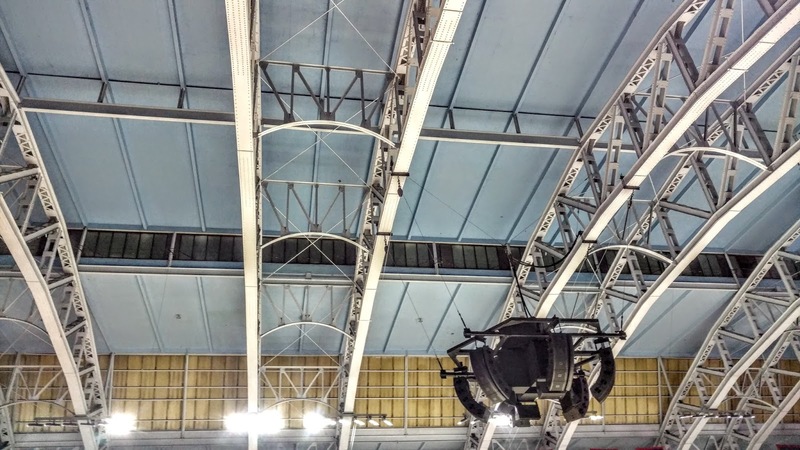 The roof is curved and no doubt has a lot to do with the acoustics. 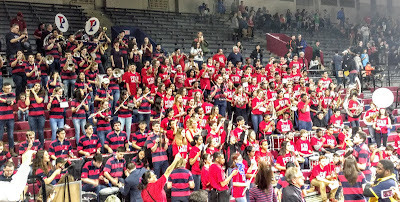 When the band was playing before the game, it was difficult to hear yourself think, even from the other end of the floor. There is a nice video board above the west end, while a more typical dot matrix scoreboard decorates the east side. Of course, there are dozens of banners in the rafters. Penn has a very successful Ivy League history, but also reached the Final Four in 1979, losing 101-67 to eventual champion Magic Johnson and Michigan State in the tournament that arguably started college basketball on its way to becoming a major sport. 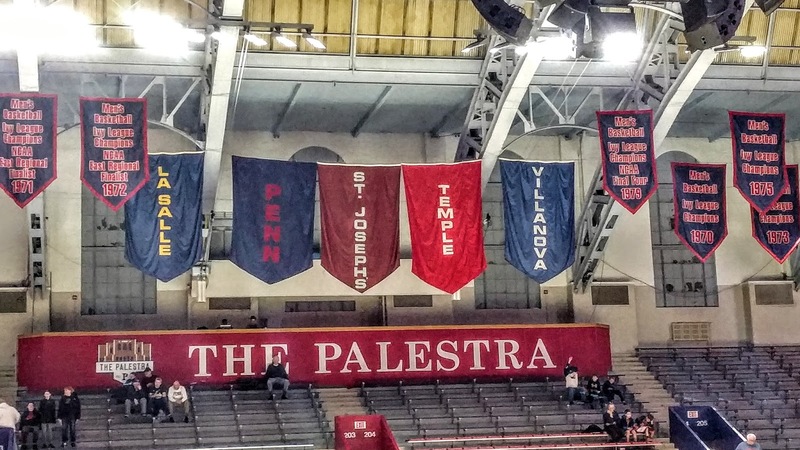 The Palestra is truly one of the must-see venues in American sports. This post really doesn't do it justice, because I did not grow up in Philadelphia or as a college basketball fan in general, so I don't appreciate the detail that a more serious fan would. Check out this article by a local beat writer, written two years ago when a Big 5 doubleheader was held here. 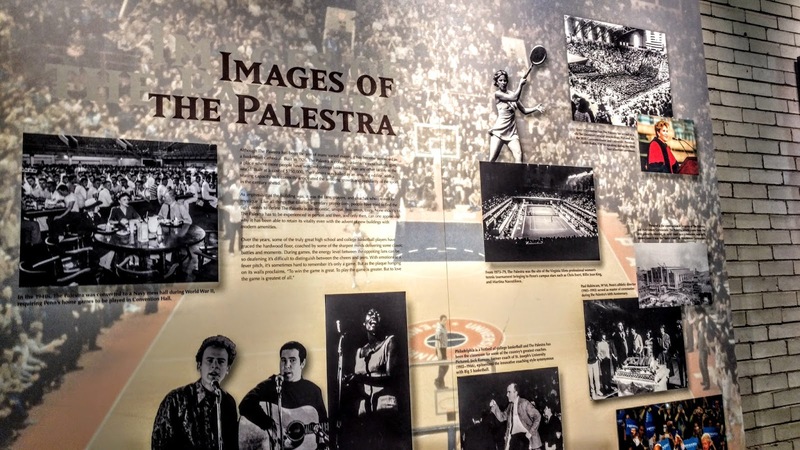 After reading that, you should be making plans to visit The Palestra if you have never seen it before. I'm glad I finally knocked this one off the bucket list. 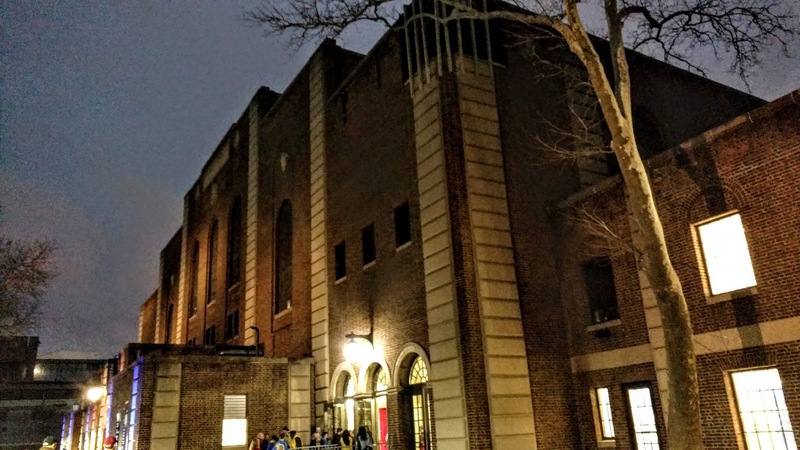 On top of this wonderful venue, there was a great matchup on tap as Harvard was in town. Both teams came in at 10-1, tied for top spot in the Ivy League. 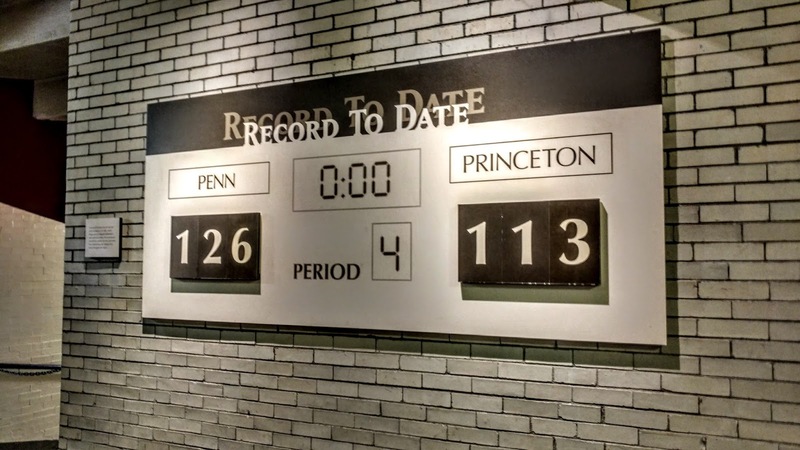 Harvard had won the reverse game in Cambridge two weeks prior so Penn had revenge on their mind. The first half was close, with neither club able to take more than a five-point lead as we went to the break tied at 35. The second half was more of the same, and with 6 minutes left, Harvard led 58-57. 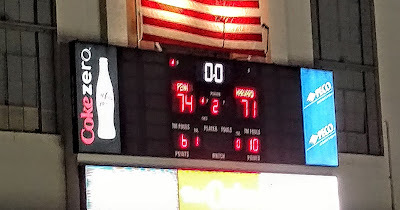 But Penn, led by AJ Brodeur's 8 points, went on a 10-2 run over 4 minutes. The Crimson did not wilt though, as Seth Towns followed a layup with a three pointer to get back within 2 with 50 seconds left. 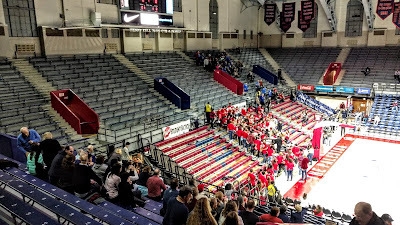 The Quakers took the ball back down the court, took 20 seconds off the clock, and then Caleb Woods drained a three that made it 70-65 and send The Palestra into paroxysms of ecstasy. Harvard was forced to foul and when Penn missed one, a Crimson trey made it a three-point game. Penn then sank both of their next free throws and Harvard followed with another three to get within 2. With two seconds left, Penn made just 1 of 2 freebies, but Harvard could not get off a Hail Mary in time and Penn held on to win 74-71. Another excellent game on this day trip, with only 33 fouls until the last minute that allowed for a decent flow. Towns led all scorers with 22 while Brodeur had 17 and 12 boards for the Quakers. After the game, the Penn alma mater was sung (above) and the band stayed well after to put on an impromptu concert as it was senior day and the last regular season game there for any senior members. Many parents were also in attendance and it was a nice way to end the evening. 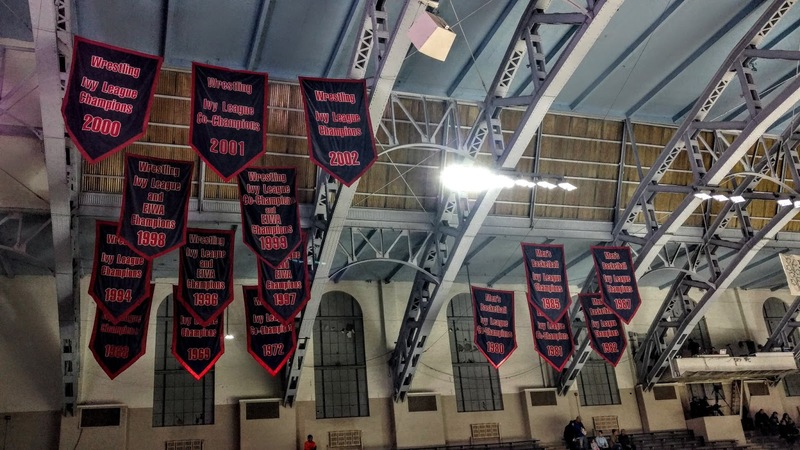 The Ivy League tournament will be held here next weekend and these two teams will have the top seeds and will likely contest the final for a spot in March Madness. Update: They did meet in the final and Penn beat Harvard 68-65 in another 3-point game and is going dancing. 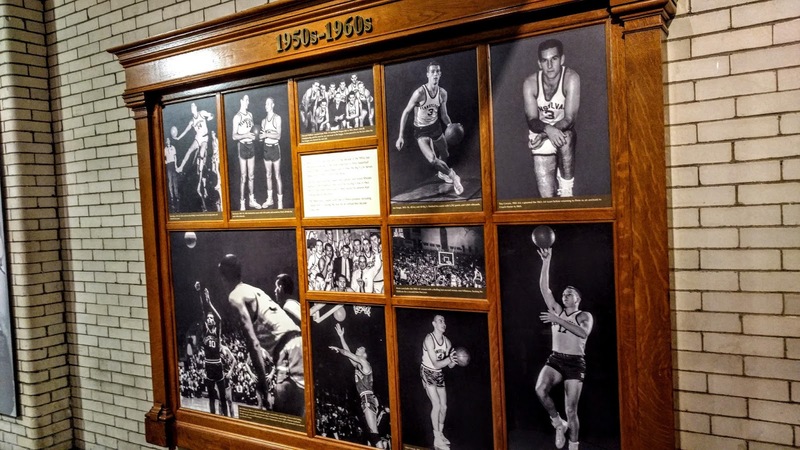 I found this article that lists 15 of the best college hoops spots, and I have only been to 5! So I'll be adding these to the list of places to go. 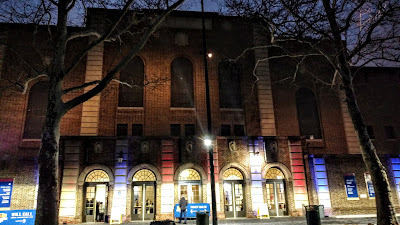 I'll be checking out some postseason hoops action in New York over the next couple of weeks as the Big Ten, ACC, and Big East all hold their tournaments here, and some mid-major schools might have on-campus games as well. The next trip will be to Montreal on March 24, where I plan to see an AHL/NHL doubleheader featuring the Laval Rocket and their parent club, the Montreal Canadiens. Check back next month for a recap.